Oak at Treetops Cottages & Spa in Grasby, near Caistor sleeps 4 people. 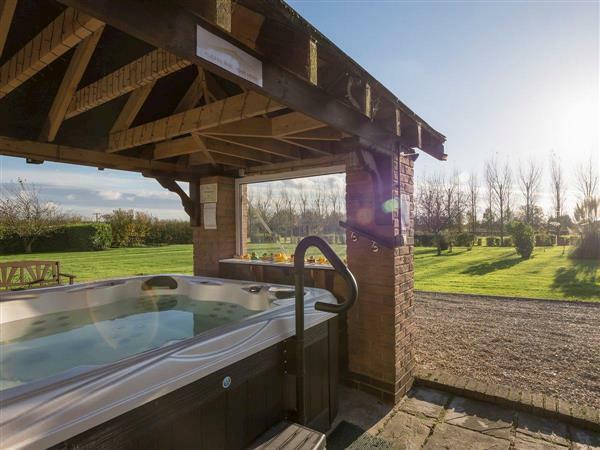 Treetops Cottages & Spa near Caistor are three holiday cottages which are set in the picturesque and peaceful village of Grasby (refs UKC859, UKC857 [Ash], UKC858 [Elm]), in the beautiful and unspoilt Lincolnshire Wolds. Ash, Elm and Oak have each been awarded a 4* Gold award for self-catering accommodation. Each property boasts spacious, contemporary and well-equipped facilities and all guests have use of the shared heated indoor swimming pool, sauna, outdoor hot tub and free Wi-Fi. There is also a spa, where guests can indulge in spa day packages and holistic and beauty treatments (please book direct with owner). There are many pubs, restaurants and shops all within easy reach, not just in the village of Grasby but also in Caistor, Brigg and Market Rasen. Enjoy a day out in historic Lincoln, or the seaside resorts of Cleethorpes and Skegness. Pleasure Island, Cadwell Park Races, Hemswell Antiques Centre, Caistor Equestrian Centre and an archery centre are attractions that are close by, and provide an excellent day out. There is also easy access to Hull with The Deep aquarium and fantastic museums, which are all free. These properties (refs UKC859, UKC857 [Ash], UKC858 [Elm]) can be booked together to accommodate up to 10 people. The shop is 3 miles from Treetops Cottages & Spa near Caistor, with the pub and restaurant ½ mile. Oak has 2 steps to entrance. Living area: With 32 Freeview TV, DVD player and iPod dock. Bedroom 1: With king-size bed, Freeview TV and French doors leading to patio. Ground source underfloor central heating, electricity, bed linen, towels and Wi-Fi included. Travel cot and highchair available on request. Welcome pack. Shared laundry on-site. Shared 6-acre natural landscaped grounds with terrace, patio and garden furniture. Shared heated indoor swimming pool (8m x 4m, depth 1.1m - 1.4m, open 8am - 8pm). Shared hot tub for 8 (no children under 16). Shared sauna (one hour use per cottage per day). Ample private parking. No smoking. Please note: There is an unfenced pond in the grounds, 100 yards away. Holidays at Oak, Treetops Cottages & Spa run from Friday to Friday. For a better idea of where Treetops Cottages & Spa - Oak is, you can see Treetops Cottages & Spa - Oak on the map below. Treetops Cottages & Spa - Oak is in Lincolnshire; should you be on the lookout for a special offer, you can find all the special offers in Lincolnshire. It's always worth checking to see what is on offer at the moment. Do you want to holiday near Treetops Cottages & Spa - Oak (UKC859), you can see other cottages within 25 miles of Treetops Cottages & Spa - Oak; have a look to find your perfect holiday location.